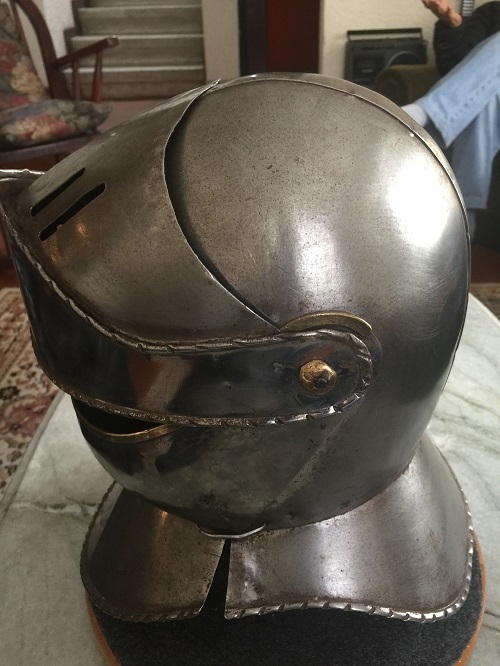 Forum Index > Historical Arms Talk > please help me identify this helmet ! thanks for reading ! 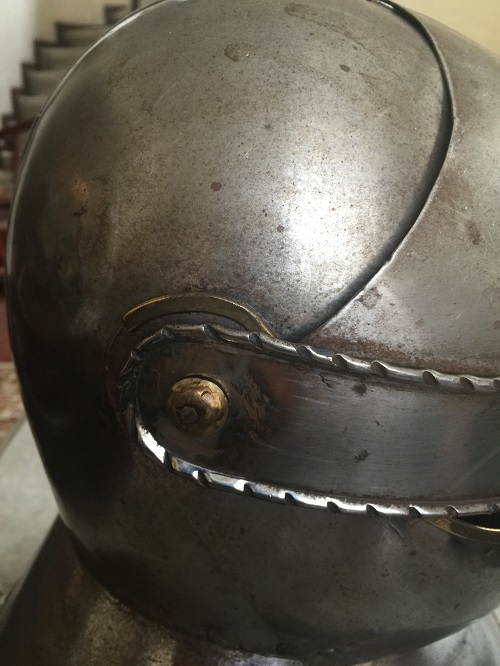 Posted: Tue 11 Oct, 2016 8:56 am Post subject: please help me identify this helmet ! thanks for reading ! 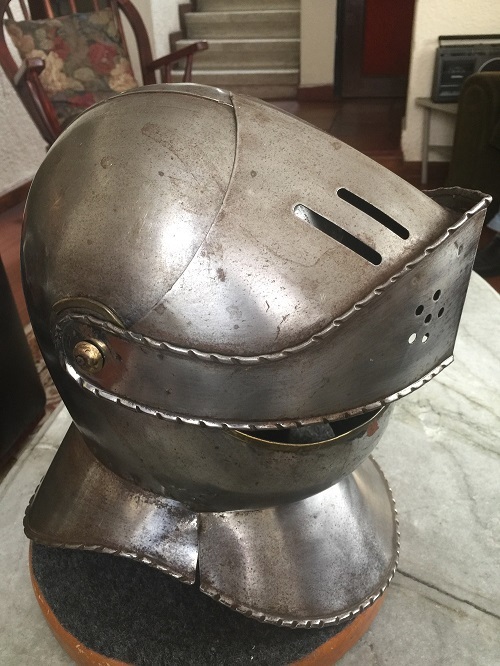 My father acquired this helmet some time ago from a collector´s widow. 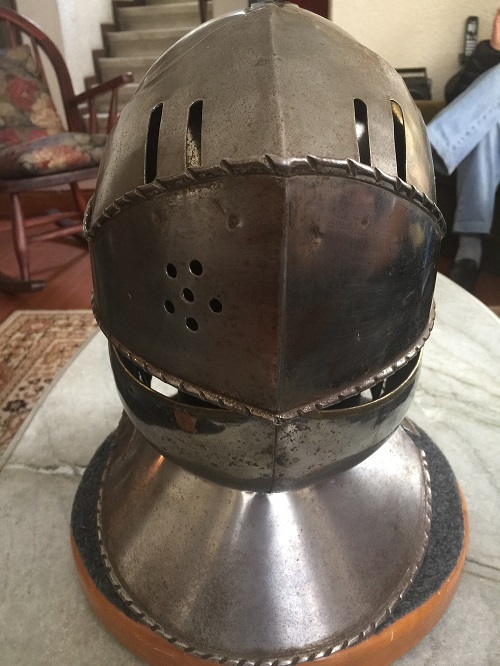 This is supposed to be a 14th century Spanish helmet. Actually my father shared some pictures with a curator of NYC Metropolitan Museum and he said that it could be authentic. Welcome to the forum! 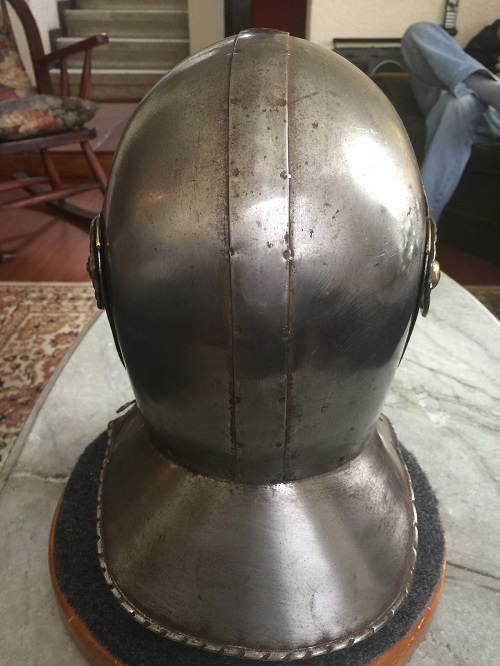 I can safely say that it is most definitely not a 14th century helmet - the style is 16th century at the earliest. I suspect it is not original unfortunately, but I'll sure there are other forum members more knowledgeable about the relevant time period who can offer you more information. 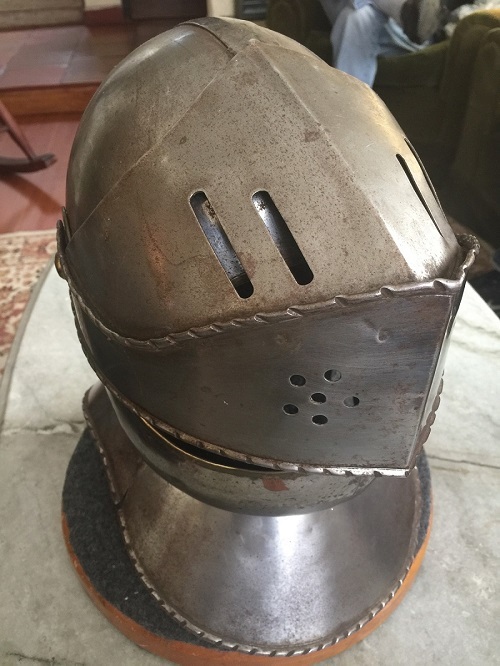 Like Mark, I don't think you have an actual 14th century antique - I'd say the style might be as early as late 15th, but his 16th is likely accurate as to the style of the helmet. 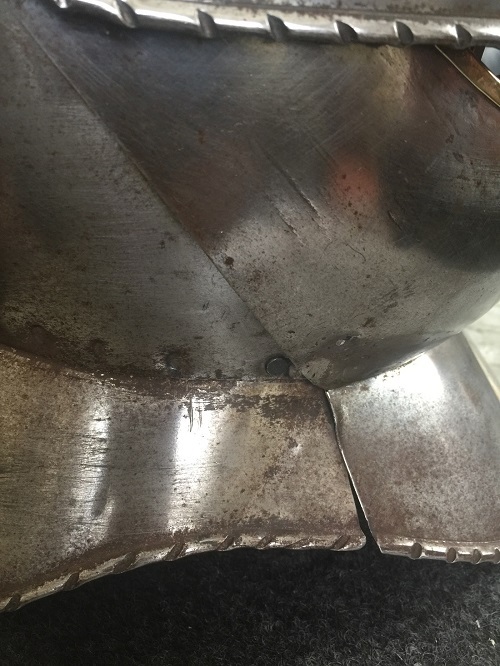 One of the big things that bothers me is the construction of the top in two halves, with clear tack welds on the exterior strip covering the seam. This method of construction, with those glaring little weld dots, scream "modern" to me, as in a late 20th century knock-off for the collector/decorative market. Others can likely provide additional cues and clues for you, but those are the things that stand out to me. that helmet is definitely not an original. It 's probably an 19th/20th century reproduction, damn historism. 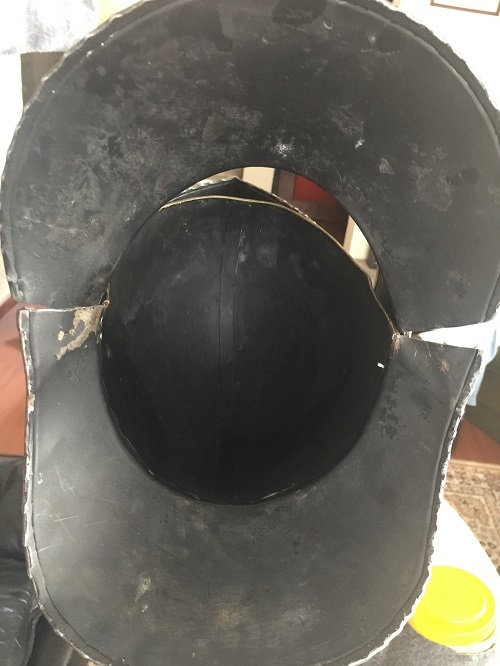 Yep, you have a not too awful late 19th/early 20th helmet trying to be a late 16th century close helm. Exactly the sort of thing made for collectors wanting something to go in their baronial hall or study. Are those spot-welds along the central strip along the top/back? Spot-welding is a relatively new technique (early to mid-20th century if I remember correctly). I believe that's exactly what they are - one of the reasons I called it out as a latter 20th century item.